Can you believe we are still at it with the 52 week challenge. Big kudos to the other gals out there that have stuck with it, and the other crazies like me who haven't missed a week. This week was touch and go for me, in fact this post is scheduled and it's amazing that I have managed to get this done. We are currently away on vacation, in fact we left 3 days ago. We are cruising around the islands of the south pacific, New Caledonia, Vanuatu etc. We've escaped the Australian Antarctic vortex that is making it snow in places that it shouldn't, so yay for us being somewhere warm. At least I sure hope it's warm and that its not raining or anything. My kids will be totally bummed if they don't get to play at the beach and try snorkeling. Let's get to this mani. This weeks theme is Coral and White, and my personal prompt is Tape Mani. I'm not a huge fan of tape mani's. They require patience so that you don't pull up your base colour, and patience is not one of my strengths (just ask my husband). This mani ended up being more coral and gold, but that's just how I roll. Using the shell charms that I got from the Born Pretty store again too. I like that you can wash these off with acetone and use them over and over again. I also like that you can paint them with polish to get totally different looking charms, like I did with the star fish on my pinky. 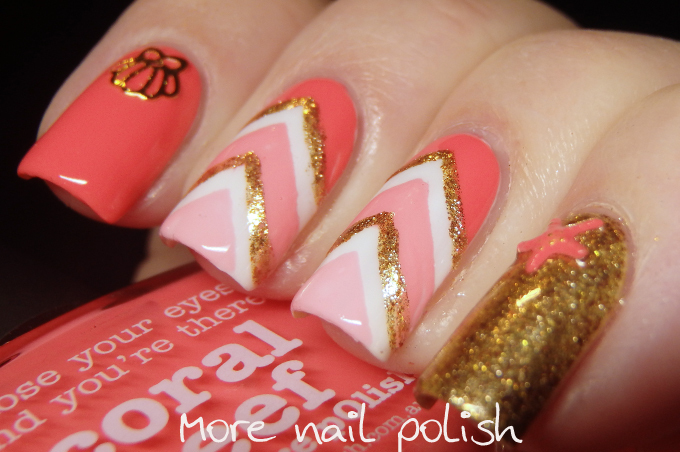 These nails are so fun and perfect for summer. 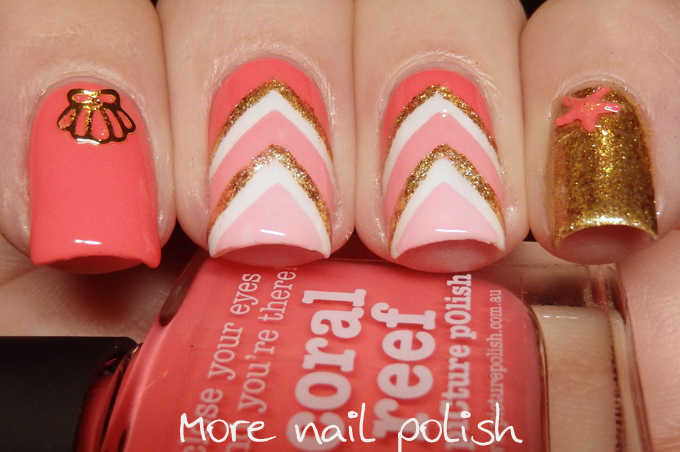 The coral is gorgeous and goes great with the gold!